Every single one of my Anhui girlfriends has a great appetite - and since all of my buddies have hollow legs, no matter where they come from, that is nothing special in and of itself - but what has continually amazed me has been that each one of them is a certified chili queen. Looking at Anhui on the map, this doesn't seem like Chili Central... this province is way up there in the northern area of China, safely distant from the spicy foods of such fiery hotbeds as Sichuan, Guizhou, and Hunan. Since I had never tried Anhui cuisine until relatively recently, I always found this puzzling. But they do love their chili peppers, and following my induction into their inner circles as an honorary lameizi (literally "spicy sister", the Chinese name for that nineties female band called the Spice Girls), I have tried to reciprocate with offerings of chili oil liberally sprinkled over dishes, chopped chilies tossed into stir-fries, and dried chilies browned in oil before the rest of the ingredients have been added. All have been met with a smile and the eternal challenge suggested by a devilish smile, "Is that as hot as you can get it?" Now that I have tasted Anhui cuisine, I understand. While chili isn't the overriding flavoring for the greatest dishes that Anhui is justly famous for, their home-style foods are often as hot as hell, but with just enough sugar and vinegar and nuts to slap the taste buds awake and leave the lips numb, ready for the next assault. Case in point is today's dish, Spicy Walnut Pork Anhui Style. At first I figured that this would be a ho-hum stir-fry of pork cubes scattered with walnuts, sort of a variation on the theme of cashew chicken. Wrong. This is one creative dish that looks difficult and clever, but is something that is easily put together. If time is going to be a problem, you can prepare everything up to the last step ahead of time so that only a few minutes are needed to whip up this dish. However, it is at its absolute best if the dish is sauced right after the meat is fried, because that way the walnuts are superbly crispy and offer a tantalizing contrast to the tender, juicy meat. The Chinese name for this is Liu hetao rou. The character "liu" is often used in the names of eastern Chinese dishes to let you know that it was given a gentle sweet and sour sauce at the end; hetao is the Chinese name for "walnuts," and rou means "meat," which in this province is almost always an indication that pork is on the menu. I've made this with pork loin, fresh bacon, and turkey breast, and they are all good. But if you are not afraid of pork fat, I have to strongly suggest that you try the fresh bacon, which fries up like crispy bacon should and imparts a heavenly texture to these morsels. 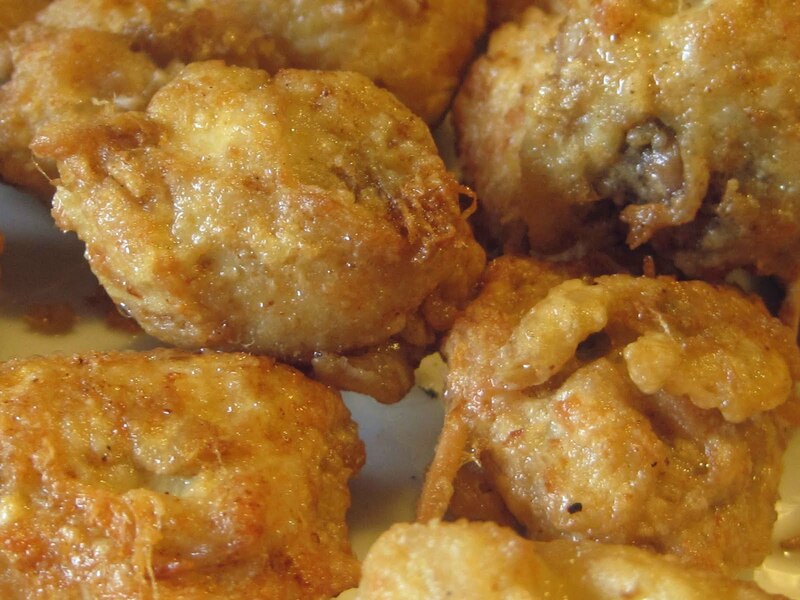 Whatever meat you use, it is wrapped around blanched walnut halves, coated in a batter, and deep fried. Please please please use fresh water chestnuts. If they are not available, use sliced jicama. If you don't have that, use a crisp pear or apple. My feeling is that canned water chestnuts and bamboo shoots and baby corn taste terrible, have lousy texture, and just add tinny smells to the sauce. Fresh water chestnuts are plain delicious, and the next post will show how to select, trim, and store them. 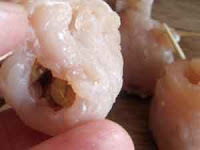 Walnuts should almost always be blanched for Chinese dishes, and the reasons are twofold: this plumps up the nuts so that there is a pillowy center surrounded by crunchiness, and the bitterness in the brown skin gets flushed away in a hot water bath. 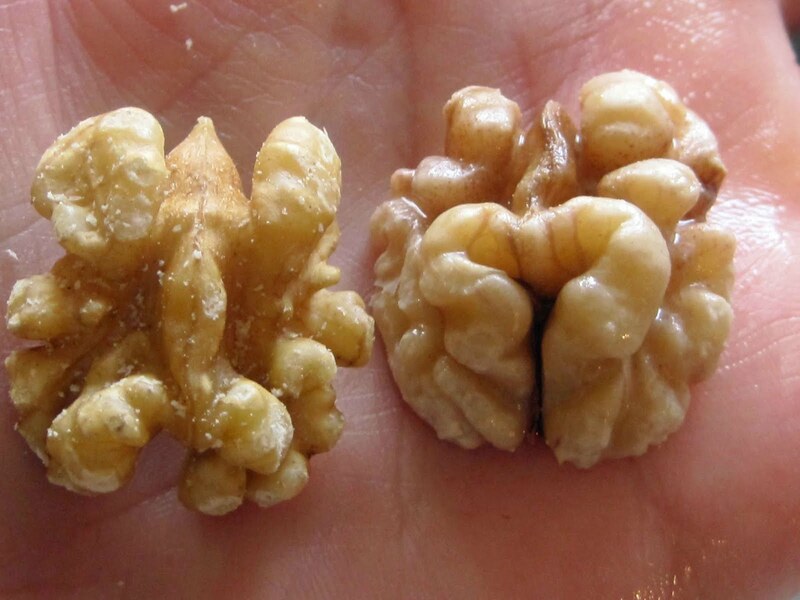 If you don't think there's much difference between a blanched and an unblanched walnut, do a taste test. Simply put, blanched walnuts have absolutely no bitter edge to them, they have a silky mouth feel, and even if you plan to fry or roast them, blanching them first puts them miles ahead of their unbathed brethren. As for the chilies in this recipe, you can adjust the heat to whatever level you want, from zero to blistering, by using different peppers. Red bell peppers are completely mild, and if you use them, even children will be able to enjoy this dish without crying. But if you have chili heads stopping by, consider using at least some nice, red jalapenos or yellow Anaheims (if not the hotter varieties) to give this dish a good kick in the pants. 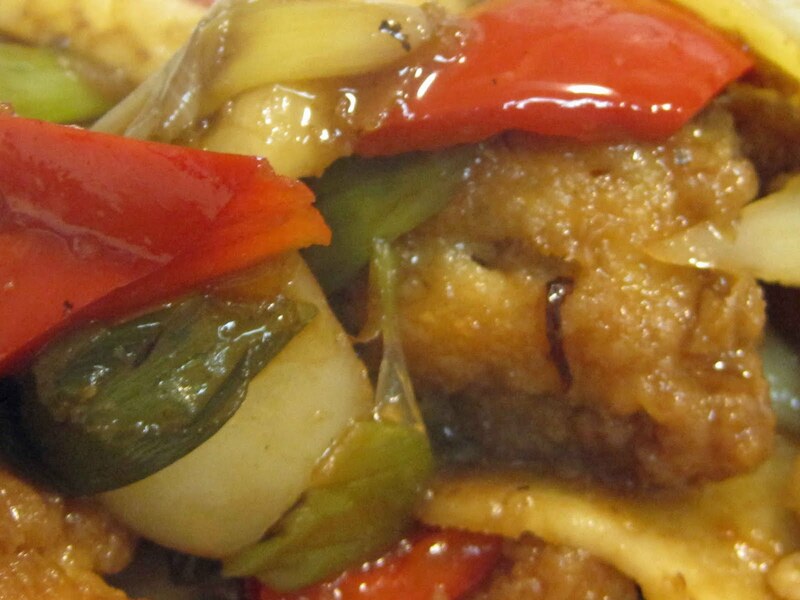 It will turn this sauce from sweet-and-sour into pure wow. 1. Place the walnut halves in a heatproof bowl and cover them with boiling water. Leave them in the water for at least 10 minutes, then drain and rinse. Pat the walnuts as dry as you can, since you will be frying them. 2. Heat about 1 cup of oil in a wok over medium-high heat until a wooden or bamboo chopstick inserted in the hot oil is immediately covered with bubbles. Place a dry bowl next to the stove for the fried walnuts and have a slotted spoon handy. Add the walnuts to the oil in small handfuls and gently stir them in the oil until they are a golden brown. Remove them with the slotted spoon to the dry bowl, heat the oil up again, and repeat with the rest of the walnuts until they are all fried, and leave the oil in the wok. 3. 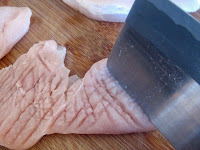 Slice the pork into pieces a little over 2 inches long and about an inch wide, and lightly salt the meat. (If the meat is too thick, lightly pound it until it is about a eighth of an inch thick.) 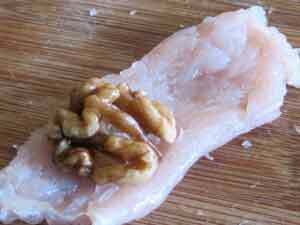 Place one fried walnut half at the end of a strip of pork, roll up the meat around the nut, and then secure it with a toothpick. Repeat with the rest of the meat and walnuts until you are done. 4. Beat the egg in a medium bowl and add the cornstarch to form a batter, adding a bit of water if it is too thick. Heat up the oil in the wok again using the chopstick test to get the right temperature. Coat each pork roll in the batter, shake off any excess batter, and fry the roll in the hot oil until a toasty brown. Remove to a plate and repeat with the rest of the pork rolls, being sure to fry only a few at a time so that they don't stick together. Take the toothpicks out of the rolls and discard them. The dish can be prepared ahead of time up to this point; remember, the walnuts won't be crispy if they are reheated. 5. If you made the pork rolls ahead of time, heat them in a single layer in a 325-degree oven for about 10 to 15 minutes, or until hot; otherwise, just proceed to fry the vegetables and make the sauce. 6. Drain all but about 2 tablespoons oil from the wok and heat it over high until it starts to smoke. Toss in the water chestnuts, peppers, and green onions, and quickly stir-fry them for a few minutes until they are no longer raw, but still crisp. Add the fried pork rolls and then the soy sauce, vinegar, sugar, and rice wine; toss them all together over high heat until most of the sauce evaporates. Taste the sauce and quickly adjust it with more soy sauce, vinegar, or sugar as needed. Sprinkle on the sesame oil, toss again, and serve.